Posted: Mon Jul 17, 2006 8:23 pm Post subject: Glazing Points (with Video). Glazing points are small metal fasteners that hold glass panes in the window sash. Video: Setting glazing points by hand and with a point driver. cut and stamp-formed out of flat sheet metal, such as Hyde Tools #45760 (flat and rectilinear, which seats well into the corner between the glass and the wood of the glazing dado), and Fletcher 08-711 #7 (flat and rectilinear), and Lakeshore Easy Points (curly-form, which take more putty to cover over) Tab types are common and readily available at your local hardware stores. If you have a very narrow line of glazing you may have to trim this type of point with a pair of pliers and tin snips, or use a smaller glazing point such as the spade type. of zinc or steel, such as Fletcher Glazier's Points 08-511 #2, probably a special order at your hardware store. Or, make your own by cutting them with tin snips from a piece of sheet metal, just like the old-timers did. The old standard Fletcher No. 5 point driver. Shoots No. 1 (3/8") and No. 2 (1/2") diamond points, and No. 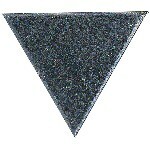 5 (11 mm) Stacked Triangle points. Sets the points about 1/32" up off of the pane. Panes must be at least 6 7/8" across to set this point driver flat on the pane. All Metal Design, Drives 3/8" Diamond Points only. The metal frame has rubber pads that set on the glass. Adjustable strike force allows the user to drive the points deeply enough in hard or softwood frames to hold with 1/8" over the glass. Only accepts CRL 1P, 1B, and NW1P points. The bottom of the PD9 Point Driver must be held in perfectly flat contact with the glass surface when fired. Failure to do so will result in Points dropping through the bottom of the driver when the trigger is activated, possibly cracking the glass. Panes must be at least 6 1/8" across to set this point driver flat on the pane. I now have a PD9 and am testing it. -- the details of construction suggest to me that this unit could be modified to drive the point further, or not so far, into the glazing rabbet. If I decide to do this I'll report on it here. The PD9 has done a good job on ten 6-lite sash. Of course, no word yet on long-term durability and performance. The general character of the PD9 suggests to me that it will not be as durable as the old No. 5. Even though I now have a PD9, I will now shop for another old No. 5, so I will have two drivers in case one conks out. I prefer the No. 5 because it places the points slightly off the glass. In the past few years I have seen two window projects done ten and fifteen years ago where more than a third of the windows have have cracks in the original 200 year old glass panes that relate directly to, and appear to have been caused by, points set directly on the glass. The cracks developed a few or several years after the glazing. The reason I'm getting some of the newer point drivers is to test them out to see if they break glass. I've never had broken glass using the No. 5. This point driver does not shoot traditional diamond or triangle points. It shoots picture framing points. The magazine holds 100 points and is reversible with a short nose for 3/8" points. Uses only FT895 5/8" points and FT898 3/8" points. 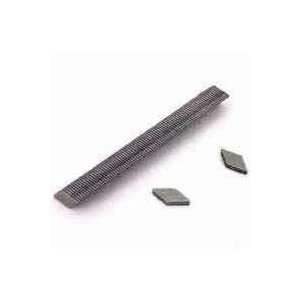 Plastic frame with tension adjustment screw for soft or hard woods. Sets points directly flat on the glass. This point driver does not shoot traditional diamond or triangle points. It shoots picture framing points. I am not counting on the quality Fletcher-Terry hand tools have had for over a century. Between 1999-2009 Fletcher-Terry was reorganized to dramatically reduce the cost of producing their tools, which are now made by iSun in China. Part of their strategy to make cheap products was to combine several separate products into one so they could interest the mass-production factories in China. Here, http://www.fletcherviscom.com/FPointDrivers/main.html you can see how all of their point drivers look the same. One thing many of us tool users know is that munti-purpose tools seldom do as good work as specific purpose tools. Let me know if you get one of these and what you think of it. Has a spade-shape with a long sharp point and a right-angle bracket formed on one side. The long strong point goes easily into the wood. The bracket that goes against the neck of the glazing rabbet and the stub that goes against the glass are small. Small parts are important when the shoulder of the glazing rabbet is particularly narrow, say less than 1/4", because the line of putty must be narrow to match the width of the shoulder and still cover over the glazing point with putty. Best for single-lite sash because the long point holds the heave pane well. On some multi-lite sash the long point could go through a thin muntin rib and crack the edge of the pane on the other side. Spades are now becoming more difficult to get. Several of the common sources no longer have them. I think you may have to set up a commercial account to use Bostwick-Braun. Your hardware store may be able to order here. Let me know if you order from here and how it goes. Make a small test order first to assure you are getting the true spade-type points. Modern glazing points are made out of zinc plated steel. The zinc helps protect the steel from rusting. 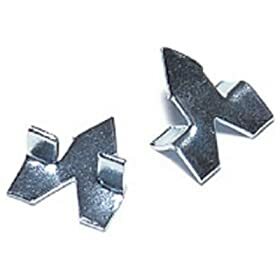 Fletcher brand points are made of C-1010 Steel with electro-Zinc coating. Before the mid-20th century points were often made of solid zinc, which is more resistant to corrosion than steel. Zinc points are not available today unless you make your own. For points in wood sashes on ocean going vessels in the 18th and 19th centuries the use of marine bronze was a standard of the Royal British Navy--only the best for the King's (or Queen's) navy. In the old days glaziers made their own points and I have done it myself on occasion. All it takes is a scrap of sheet metal and tin snips. To make triangular points, first cut strips that are 5/16" to 3/8" wide. Then snip off the points with angled cuts, flipping the strip over after each cut. If your snips leave the points curled a bit, you might have to tap them flat with a hammer on a piece of flat steel. I recall making 30 points per minute without pushing it. If you look carefully at some of the old points you pull out you may see they have the variability of hand-made goods. If you've been to one of my training sessions you've seen some of these hand-made points from the early 19th century. The Fletcher Framemaster point driver sets the points right down on the glass, which is great for artwork. Some window specialists swear by it too. The Fletcher No. 5 sets the points about 1/64" up off the glass. I like this space because putty fills it and protects the glass from stress and breakage. When George Hubbard invented the point driver he spaced the point up off the glass for just this reason. George Hubbard was a wide ranging inventor and entrepreneur based in Windsor, Vermont. Hubbard invented the diamond-shaped glazier’s point and the tool to set it about 1880. Next time you're in Windsor stop in at the American Precision Museum and see George's patent models and several early production point drivers. They are exactly like the Fletcher No. 5 we all know and love. To get your point driver to set the points a little deeper hold a big block of iron or steel against the other side of the muntin, stile or rail. A block about 2" diameter by 5" long works fine. An ordinary 20oz. framing hammer is too light. A little 5lb. sledge hammer with a short handle works, but you have to grind off the face so there is a crisp right angle or you may end up with split muntin ribs. This keeps the thin muntin from bouncing away from the point, which absorbs some of the energy of the driver. Be careful though on thin muntins; if you drive the tip of the point all the way through a muntin it may strike the edge of the glass on the other side and break it. Vary how deep the point goes by the size of the steel block, the smaller block has less mass and the point goes in less. Fletcher stopped making the No. 5 point driver in 2009, so new ones are no longer available. eBay is a potential source, that's where I got mine. Some window specialists use the Fletcher FrameMaster point driver, which is still available. It drives arrow-shaped points that are made for picture framing. Posted: Tue Jul 18, 2006 7:31 am Post subject: benefits? Are there benefits to the spade type over what we can find at the box stores? For those of us working on our own homes, are the box store points OK to use, or is it worth the effort to find the others? The characteristics of the spade-push type that makes them particularly useful on some sash is that they have a long strong point that goes into the wood, and the parts that hold the glass and go against the neck of the glazing rabbet are small. Small parts are important when the shoulder of the glazing rabbet is particularly narrow, say less than 3/16", because the line of putty must be narrow to match the width of the shoulder and still cover over the glazing point with putty. Glazol has good handling characteristics, and a rather long skin-over time. It is of the Modified Oil Type, Nonhardening. The demonstration was the first time I have actually used the Sarco Type M putty. It handled very nicely, was quite soft, did not stick to my hands much (with use of whiting powder), tooled into place very well, stuck to the glass and primed wood well, plus it has a reputation in the window industry for good performance and a long service life. It is my current top choice for the Traditional Linseed Oil Type, Hardening. I'll set up a little comparative demonstration of several putties to show skin-over time, for next week's conference. For much more on putties, click on "Windows & Doors" above to see other discussions here at the Forum, particularly "Putty Analysis." I have not seen these #11 size, I'll try to get some at my local Aubuchon's. We have to let Ralph know about this. looking for bulk, I would have to get you different pricing. Conveniently located online at http://www.HardwareStore.com. quantity of the spade push-type glazing points, made by Tower Mfg. I've contacted the good people at Aubachon about getting a pound or two of the Tower M15 points but haven't heard back. I called a week ago and they were going to check with Tower about availability and then e-mailed but still no reply. Has the well run dry on points? Do I need to resort to buying 1/2 an ounce at a time? Please no...somebody help me. Posted: Wed Sep 19, 2007 6:46 pm Post subject: Tower has stopped making points! I got a call from the good people at Aubuchon Hardware. They have informed me that Tower is no longer making glazing points. They only have 7 pounds left after I placed my order this afternoon. Get them while they last. It is always a sad day when we loose a good friend we have gotten to know over these past years and decades. Tower Manufacturing is canceling their production of the famous M15 Spade-type glazing point. Tower is the last known manufacturer of this fine point. These tiny bits of metal were known far and wide for their ability to fasten the panes in many an old window sash. A long-time holdout and remnant from the old days when glazers were glazers and their points could be counted upon when the going got tough, these were the points that saved mens' souls as they worked late into the night finishing up that last stack of sash to be delivered first thing in the morning; that won womens' hearts when the line of glazing got so narrow there was no hope left; and that saved the lives of playing children when the putty had finally weathered away and the trusty Spade point staid the loose pane preventing sharp shards of splintered glass from raining down upon their innocent heads. If each of us stops now for a moment of silence we will recall how good old Spade save the day at least once in our lives. How can we forget--not easily, not without a heartfelt tug, not without a tear in the eye. Every time we pick up a putty knife we will recall good old Spade, no longer with us. Such a tragic loss. Yet, there IS hope. Even after the coldest darkest night, the gray light of dawn and warm sunlight surly follow. Spade lives on, in many old and new sash, doing his best, as only he knows how, locking hundreds, nay, thousands, perhaps millions of panes of glass firmly and solidly into their sashes. Who else could perform such a feat, even after his demise? I tell you, only good old Spade could do such a thing from the other side. Spade is survived by T-type, Triangle and Diamond point, all still in production, but none so fine as the one and only spade. Thanks to the tireless research efforts of John Lindtner, restoration contractor in Delaware, we learned the tragic news just today. find a source for the glazing points. See the message at the top of this discussion. I have just added more information about diamond points including a link to an online source. I found the spade points at a local Do-It_Best hardware; they are very nice. Rather than mess with my putty knife, i use a heavy flat screwdriver; gives good leverage, and this might be useful; the blade on this particular screw driver is magnetized, allowing me to hold the point, and also, easily pickup excess points to put back in the box. I just used one of the small magnetizer-demagnetizer blocks that should be available where tools are sold. I think the reason I use a putty knife to set the points is that I already have it at hand, as I get ready to tool the putty. Using a putty knife that is a little flexible can help beginners prevent glass breakage. Professionals usually prefer rigid putty knifes because a flexible one wastes effort. That's a good tip on using a magnetized tool, I'll give that a try, perhaps magnetizing my putty knife.